So these gifts may be slightly stereotypical - whiskey, beer, gadgets. But c'mon, what guy wouldn't be happy with these fun goodies? 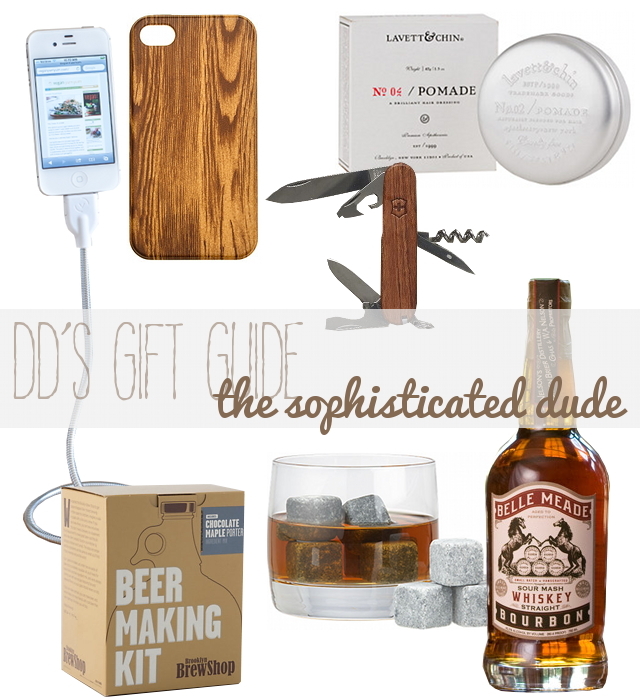 Here are some of my gift picks for the sophisticated dude in your life. Une Bobine Bendable Phone Cord/Tripod, $30 from the Photojojo Store: Seriously, like the coolest thing ever - he can charge his phone whilst creating an amazing camera tripod. "Wooden" Rubber Case for iPhone 4, $25 from J.Crew: Enough with the boring black phone cases - this one is cool, stylish and super masculine. Lavett & Chin No. 02 Hair Pomade, $38 from J.Crew: This fantastic product will create that not-trying-too-hard messy 'do, while it conditions and keeps his hair smelling great. Spartan Hardwood Swiss Army Tool, $37.95 from West Elm Market: An all-in-one toolkit that fits in his pocket - plus he'll look super cool opening a bottle of wine with a swiss army knife. Belle Meade Bourbon, $39.95 from Nelson's Green Brier: ...an olde timey spirit with an awesome story. Brooklyn Brew Shop Chocolate Maple Porter Home Brewing Kit, $40 from Anthropologie: Beer's cool too.